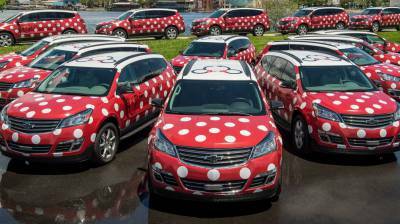 As of March 31, 2018, Disney resort guests can pay to have a Minnie Van take them to the Orlando International Airport for $150. The service is offered to guests with airline flight departures out of Orlando International Airport from 9 am until 12 am daily (earliest pick-up time is 7 am). The Minnie Vans can accommodate up to 6 guests per vehicle and up to three car seats for guests under the age of six. If you use the Minnie Vans to get to the airport, Disney suggests you still use the Resort Airline Check-In for participating airlines because luggage space is limited. They really need to offer this from Sanford International . There is a big gap in the transportation offering.